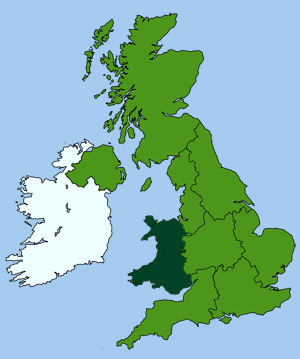 This area contains the counties of Carmarthenshire and Pembrokeshire, which make up the majority of the south-west peninsular of Wales. Carmarthenshire's green fertile landscape has earned it the nickname of the garden of Wales. It is one of the UK's most visited counties, packed with fine old churches and impressive medieval castles. It is hard to believe that much of the coastline was reclaimed from industrial wasteland over recent years, revealing some amazing pristine beaches. Carmarthen bay, which was an inspiration for Dylan Thomas, is still a big draw for holiday makers to this day. Pendine sands (Carmarthenshire), is the location for some of the first world land speed records. The first set by Sir Malcolm Campbell in 1924, reaching a speed in his Sunbeam car of 146 mph, the first of his nine land speed records. Pembrokeshire's 180 mile coastline is the jewel in its crown and home to the only coastline national park in Britain, the Millennium Coastal Park. 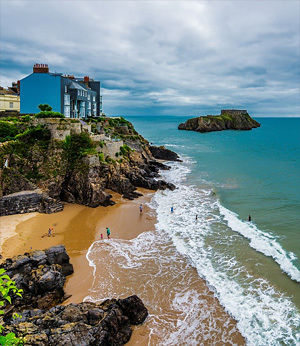 With 186 miles of stunning coastline, more blue flag beaches than any other county, plus a wealth of protected environmental sites, old industrial buildings and historical remains, there is plenty to do and see in this beautiful part of Wales. Carmarthen Yeast Cake - a rich fruit loaf enriched with golden syrup. Pembrokeshire Potatoes - said to be the sweetest grown in Britain.